Implants can be placed in any one of four positions. Each position has its specific advantages. Which implant position is best for you will depend on your breast appearances, breast measurements, physical activities and the ‘look’ you’re after. The implant is placed behind the pectoral muscle. It creates a more natural appearance because the muscle provides additional coverage over the edges of the implant and thereby helps to avoid a ‘stuck on’ look and visible ‘step’ along the upper edge of the implant. There is less chance of visible Rippling/Wrinkling. There is less chance of Capsular Contracture. There is less interference with Mammograms. There is less chance of interference with future breast feeding. The implants are further away from the breast tissue and are therefore less likely to be involved in any breast diseases or be damaged during any fine needle biopsy of a breast lump. 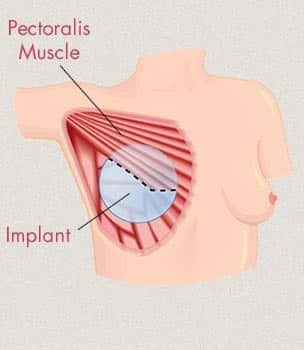 The implant is placed immediately under the breast tissue itself, between it and the underlying pectoral muscle. 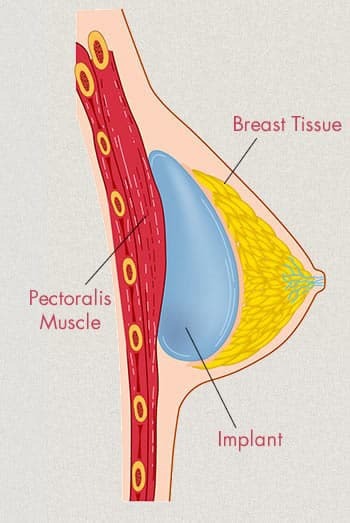 In those with impending or mild sagging of the breasts, constricted lower breast poles and tuberous breast deformities. In those engaged in heavy, repetitive pectoral muscle exercises e.g. body builders, weight lifters. However, it is not a good option for those women with thin chest wall tissues as the insufficient coverage of the implant edges would create a ‘stuck on’ look. This is simply a variant of the ‘in front of the muscle’ position with basically the same advantages and disadvantages. The lower half of the implant is in direct contact with the breast to provide ‘fill’ and ‘lift’. This implant position is preferred in special situations such as mild sagging, constricted lower poles and ‘tuberous breasts’ when there is insufficient chest wall tissue coverage to allow the implant to be placed entirely ‘in front of the muscle’. Whereas mild sagging, constricted lower poles and ‘tuberous breasts’ could be equally corrected with an implant ‘in front of the muscle’, the latter position could produce a ‘stuck on’ look due to visibility of the implant edges in those with insufficient chest wall tissue coverage. What are the various implant positions? Which implant position is best? Each position has its pros and cons but unless a specific alternative placement is indicated, we always recommend the Sub-Muscular position because it delivers a more natural ‘look’ due to the extra tissue coverage over the implant. Unfortunately, in contrast, the ‘In Front of the Muscle’ position often delivers a ‘stuck-on’ appearance when there is insufficient tissue coverage to hide the implant edges. Admittedly, ‘Under the Muscle’ does take a little longer to do than ‘In Front of the Muscle’, but our aim has always been to deliver the best possible ‘look’ for each patient and we don’t charge any more for the Sub-Muscular position. Some surgeons use the ‘In Front of the Muscle’ position routinely. It’s quick and easy, but for us, it’s about placing the implant where it will deliver the best ‘look’, not what’s easiest and quickest! The other positions, Sub-Fascial & Dual Plane, are reserved for special circumstances. Our surgeon will explain which position you would serve you best, and why, at your initial consultation. What are the advantages of the ‘Under the Muscle’ position? It delivers a more natural ‘look’ because the muscle provides additional coverage over the edges of the implant and helps to avoid a ‘stuck-on look’. Is there a cost difference with the various implant positions? There is no cost difference between ‘Under the Muscle’ (Sub-Muscular) and ‘In Front of the Muscle’ techniques. However, special techniques such as Dual Plane Placement (Partly ‘Under’ & Partly ‘In Front of the Muscle’) may involve a slightly higher surgical fee depending on what else needs to be done. Find out which Implant Position is best for YOU!